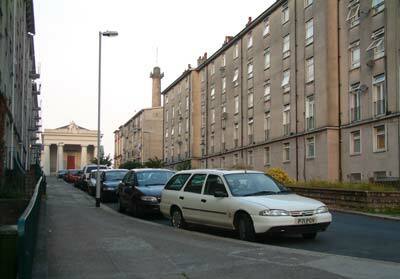 Ker Street is in the south of Devonport, in the general area of Mount Wise. Until the early 1800s the site was known as Windmill Hill. Although there were one or two properties between 1810 and 1820, most of the original development of Ker Street began around 1820. 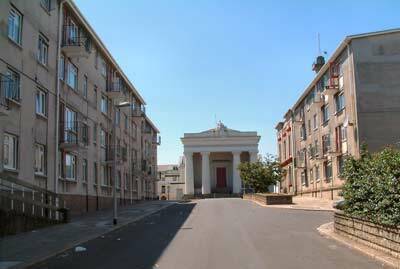 The properties built in the street at this time were good quality residential terraced houses, mostly of neo-classical design and several with Roman Corinthian columns. During the 1820s Foulston designed an 'experimental' set of civic buildings for the top of Ker Street, and three of those remain to this day - the Column (1824), the Guildhall (1821) and the Odd Fellows Hall (1823). 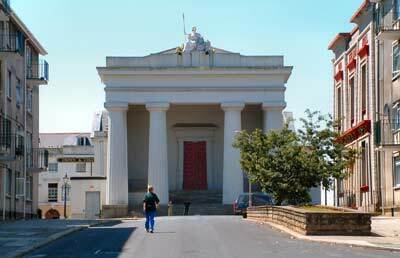 Through the remainder of the century Devonport's administration was carried out from the Guildhall, thus Ker Street became the civic hub of the town, until Devonport's amalgamation with Plymouth in 1914. 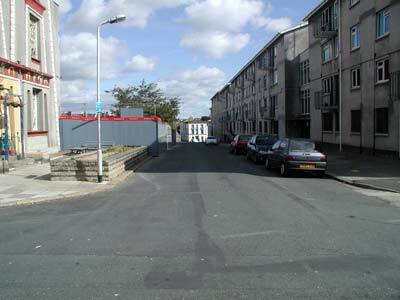 Along with much of Devonport, parts of Ker Street suffered in the blitz of World War Two. Several of the original large properties remained well into the 1950s, albeit some now in poor condition, but their end was near - by the 1960s they'd all been demolished to make way for the new post-war flats. 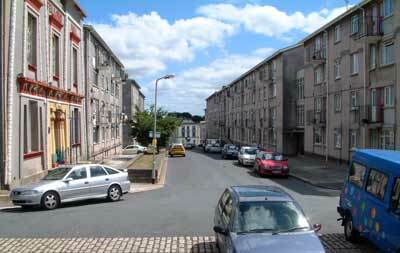 The development of Ker street during the 1960s was ad-hoc; there was no town planning strategy, neither was the cultural, social or economic side of Devonport life taken into consideration by property-developers of that period. 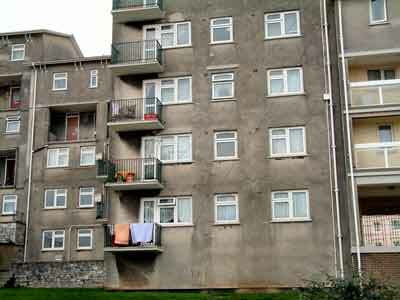 It was poorly developed, with blocks of flats built simply to house growing 20th century needs. In 1962, at the eastern end of Ker Street facing Cumberland Gardens, the infamous Bullring was built. 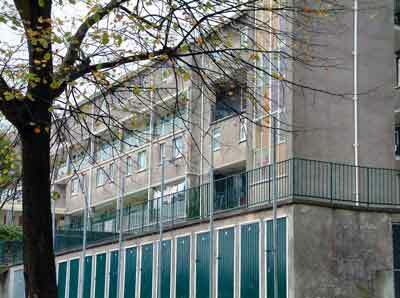 The rest of the Ker Street flats were completed around 1966-1967. Above. Ariel view of Ker Street 2007, image by Google. The triangular block on the northern side of the street was nicknamed 'The Bullring'. Below. The Bull-Ring 2003, viewed from George Street. The lack of appropriate planning of the 1960s Ker Street, with little concern for other aspects of daily life, reflected what what happening across all of Devonport in this period. 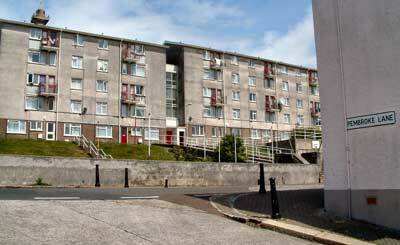 Eventually social problems arose, in part, allegedly, due to some anti-social families living in the poorly-planned blocks of flats. Ker Street was no longer a desirable place to live. By the late 20th century it had become an area of decay and significant social problems, with frequent crime instances at the Bullring, and much anti-social behaviour in general - such as old mattresses and fridges being dumped in the communal areas. 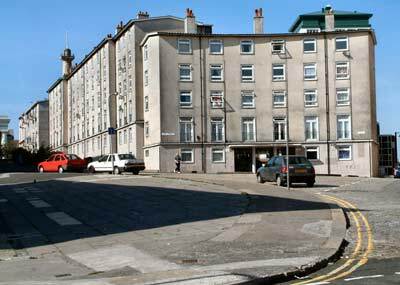 When the 21st century arrived urban analyses were carried out across Devonport, including Ker Street, and feasibility studies shortly after 2000 concluded it would be neither economically nor socially viable to refurbish and maintain the Ker Street flats as they were. The decision was made to demolish and rebuild. In 2005, when the Admiralty released for public use the nearby South Yard storage enclave, the opportunity arose to redesign Ker Street and the surrounding area in a comprehensive way. The plan was to build new road links through Ker Street, to provide access between the newly released (and about to be developed) South Yard and Mount Wise waterfront. 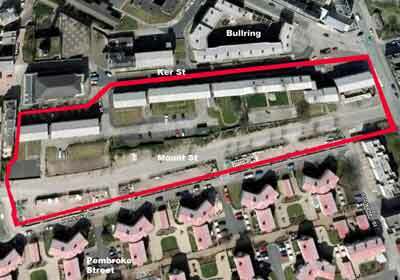 The new access routes would remove the isolation Ker Street had suffered since the 1960s development, and play a strong part in reconnnecting the whole of Devonport once again. The main entrance to the Bullring block, above, became the location of the site notice boards, below. Residents were decanted during 2006 and 2007. Demolition work began in June 2008 with Mr Philip Coombe being invited to drive the first demolition vehicle. Mr Coombe, who was then aged 78, lived in the former Bull Ring development from the time it opened in 1962 until he moved out in June 2006. He lived first at number 14 and then at number 12. The Evolve project is to be carried out in a series of Phases and completion will take several years, possibly until 2013. The first phase of the regeneration is the north side of Ker Street, to include replacement of the Bullring and of the flats next to the Odd Fellows Hall. In their place will be 62 new homes of mixed variety i.e. 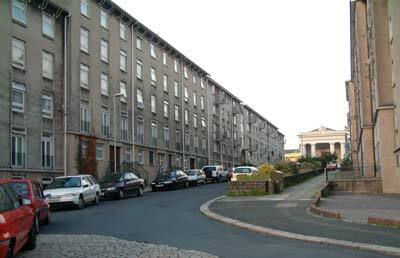 one and two bed apartments, and two, three or four bedroom houses, with gardens. Phase One was partially opened on 11 July 2009 by swimmer Sharon Davies MBE – by unveiling of the new show home - a three bedroom, three storey townhouse. Prices of the first three-bed homes started at £144,950. 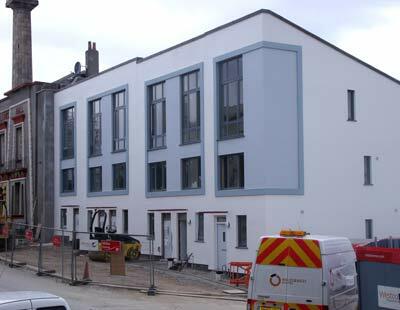 The showhome is seen in this photo taken June 2009. 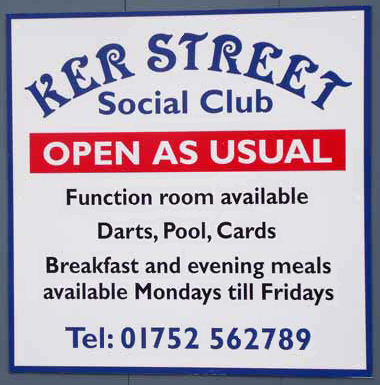 Two Ker Street leisure premises are remaining open during the rebuild period; the Crown and Column and the Ker Street Social Club. Phase 2 of the Evolve project was given planning permission in September 2009. Phase 2 re-development includes the southern side of Ker Street (or the left-hand side if you are looking uphill towards the Guildhall) and the area to the rear of that block - which is the eastern half of Mount Street, and Pembroke Lane, see the Phase two boundary marked on the Google image below. There will be 129 new homes on the plot,comprising 92 houses and 37 flats. It is here in Phase 2 that the largest changes will take place. Mount Street, to the south of Ker Street and previously the east-west route through to Mount Wise swimming pools, is to be built over with homes. Pembroke Lane, to the south of Mount Street, is to be widened and will become the east-west vehicular route that Mount Street once was. There will be a wide open public space in front of the Guildhall, this space leading down into Pembroke Lane via a formal set of steps - the space and the steps all inspired by classical proportions. Along Ker Street there will be three-storey, narrow-fronted, terraced housing, with higher flat blocks on the corners. On the new north and south linkages similar three-storey housing will be built. Terraces of smaller, two-storey homes will front onto the widened Pembroke Lane - with a small court of 'coach houses' above garages in the far west of Pembroke Lane, adjacent to Mount Wise school. At least 30 per cent of the scheme will be affordable housing with a mix of privately purchased and socially rented homes. The development has been designed by Lacey Hickie Caley architects. Planning details and drawings may be found on the Plymouth City Planning website. 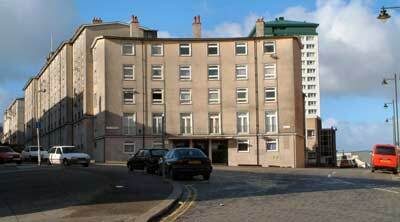 The next few images are millennium views of the rear of the south side of Ker Street. 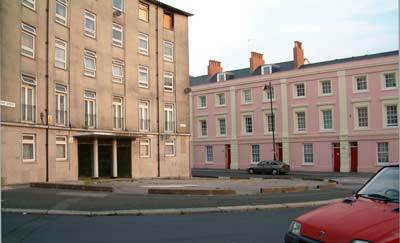 The Mount Street homes, the corner of which can be seen in the second picture, have gone already, demolished earlier in 2002, the Ker Street properties to disappear shortly, probably in 2010. 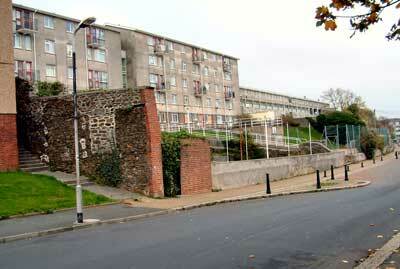 Above 2001 - rear of Ker Street flats, and Mount Street (soon to be built over with homes). 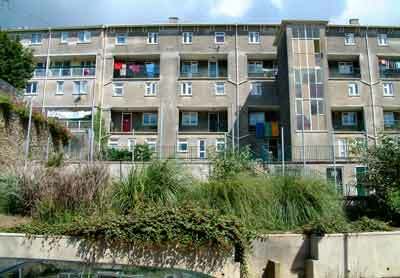 Below 2002 - rear of Ker Street flats, Mount Street crossing left to right of photo, and showing part of Pembroke Lane (soon to be widened and replace Mount Street as the east-west through route. The UK recession in 2009 threatened to stall the Ker Street development - with prospective buyers struggling to obtain mortgages and builders being laid-off from the construction site. This was the situation all over Britain. In response the government introduced the ‘Kickstart’ programme - providing funds to the building industry, to get workers back on site and projects back on schedule. Midas Homes/Westco received Kickstart funds of £601,000 toward Phase 1, and £1,450,000 towards phase two of the Ker Street redevelopment, enabling the Evolve site to continue. A local response to the recession problem came from the city planning department; permission was granted for a revised design for the Bullring site, whereby some of the flats are to be replaced by offices. 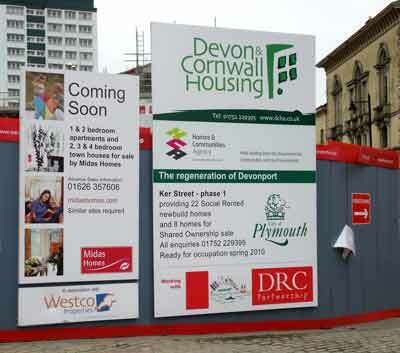 Devon and Cornwall Housing Association plan to relocate to the new Ker Street offices at the end of 2010. Completion of the full Evolve site, Ker Street and surrounds, is expected by 2013. 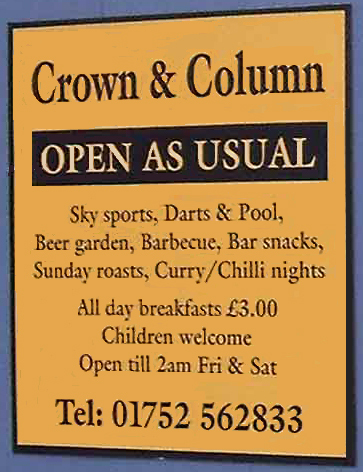 As the site progresses further images will be posted here showing the changes. Evolve have a show home off Ker Street, open Thursdays to Mondays, 11am – 5pm.